It’s funny how things fall into place in a timely manner. I love ZZ Top, remember them from my days as a young little girl, yearning to wear the cute heels and ruffly socks in their “Legs” video. In fact, I believe I made a reference to that memory a while back under the Hot Vs Not tab (White Socks), and I also added the ZZ Top “Legs” video about a month ago under the “Weekly Music Vid” side bar. I guess my crazy intuition was telling me that ZZ was about to do something hot, real hot. 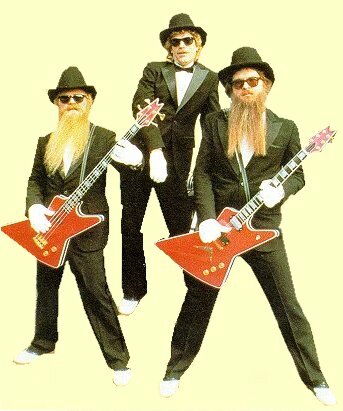 It’s a ways a way but ZZ Top are gearing up for a brand new album, with the legendary Rick Rubin producing it. Apparently, Rubin wants to hook ZZ Top up with The Black Keys, a very wanted duo lately. There are some plans for some writing and possibly some recording. It will be the bearded collaboration of the century. Also, check out ZZ Top’s expanded 25th anniversary “Eliminator” Collectors edition dropping August 25. This entry was posted in Uncategorized and tagged blues, eliminator, hot legs, legs, new album, rock n roll, rock n' soul, The Black Keys, zz top on August 20, 2008 by Sandra Burciaga Olinger.